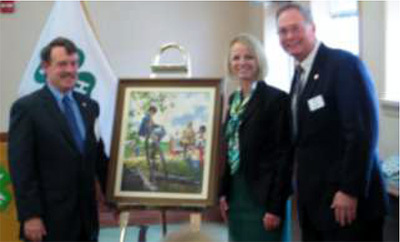 Jim Kahler, founding member of the National 4-H History Preservation Leadership Team, recently presented to National 4-H Council an original painting produced for a National 4-H Calendar in 1975. Receiving the gift were Jennifer Sirangelo, Council President and CEO, and Paul Koehler, SVP and General Manager of the 4-H Conference Center. It is now one of 36 such paintings in the collection being preserved and displayed at the Center. features 4-H’ers in the very popular photography project. About two years ago the History Team was documenting and cataloging the original calendar art at the National 4-H Youth Conference Center. We know there are pieces that were produced but never given to the Center. as we were trying to date some of the pieces Jim went online to see if he could find any information about one of the undated pieces. He related the following to National 4-H Heritage Club members and 2014 Hall of Fame Laureates at a recent Council luncheon: “I came across this 4-H calendar painting for sale on e-bay; I shared it with the team, but no one had known about this particular piece. The sale price was quite high, so I continued to check it for months hoping the seller would lower the price. At one point, the painting disappeared from the web, and I thought perhaps it had been sold, but I continued to check the site just in case. The artist is the well-known American illustrator, Mayo Olmstead, who also produced the art of Olympian Bruce Jenner that appeared on Wheaties boxes across America several years ago. Olmstead was hired by Brown and Bigelow Calendar and Advertising Company of St. Paul, Minnesota to paint 4-H calendar art. The Council collection has two other undated calendar paintings done by him for Brown and Bigelow. This entry was posted in History and tagged 4-H History by Larry Krug. Bookmark the permalink.